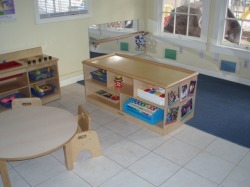 The infant room is divided into different activity areas and play spaces for the children to explore. We have a quiet area, which includes blankets, pillows, soft toys and books. Our active/large motor area includes blocks, balls, a pull-up bar and mirror. For dramatic play we have dress up clothes, baby dolls, and a wooden sink and stove with play food and dishes. Manipulatives center includes puzzles, musical instruments and various fine motor materials. The children also play outdoors several times a day in our tree-shaded playground. There is a patio for the babies not yet mobile to spend time on blankets outdoors. The families provide all food for the children in the infant room, and we welcome breastfeeding mothers to come nurse during the day.